Baby showers are my nemesis. I don’t think you understand…I really hate them. Don’t get me wrong I love a sweet smelling fatty all day long. Spit up on my Michael Kors blouse, that’s all right – get me some sparkling water, the blouse will be fine. You got a baby, gimme – because I want to bury my nose in their folds. But a baby shower? Now you’re just talking crazy. I want no part of it…at all. 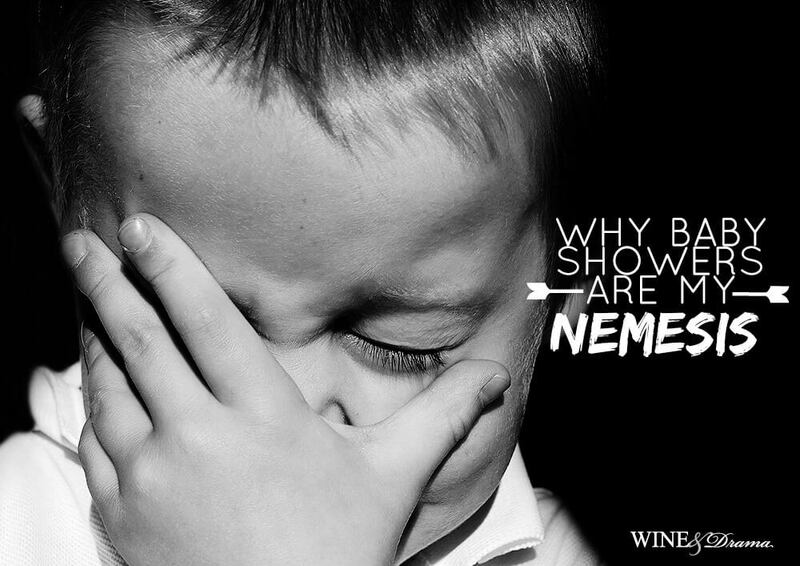 Let me tell why a baby shower is the worst occasion, ever. It takes normally sane women and turns them crazy. First, there’s the planning involved. Planning is kinda my thing, I love to plan events. I’ve dutifully thrown a baby shower and it was an amazing sangria and champagne filled soiree. I even coordinated everything in shades of lavender and gray. I forced my sister to create hundreds of glitter covered butterflies to be used as decorations, so everyone could be bathed in “butterfly kisses,” yes, I hate myself a little for writing that. I slaved for three days creating a brunch to the exact specifications of the mom-to-be – because I love her. The baby shower I threw for 40 ladies complete with tablescapes and witty place cards, deserved its own mic drop. But, for the love of wine don’t invite me to a baby shower, ever. First there’s the mom-to-be, often she’s totally and utterly miserable. Can you blame her? If you had a bowling ball waiting to come out, you wouldn’t be a happy camper either. Now, you’re forcing her to put clothes on, of which she’s loudly cursing you for…then you’re going to force a prego lady to put on shoes too? That’s like caging up baby puppies, shame on you. Then there’s the logistics…where should it be, what are you going to eat? More importantly what are you going to drink? Although you want to bust out a bottle of Mollydooker The Boxer Shiraz wine straight from Australia and drink up you can’t. A baby shower begs for sangria, Champagne, Prosecco, or Rosé and while all of those are fabulous wines – I love each and every one of them like the children I never had. When we’re talking about the def-con stress levels that a baby shower induces you can’t be serious and think a glass of bubbly is going to cut it? You need strong, big fruit, high octane wine. One that knocks you on your backside like a good French kiss will, you need a wine that can take care of you. That’s where Mollydooker The Boxer Shiraz comes in – made by Sarah and Sparky Marquis (great name by the way) straight outta “Oz,” is delicious. 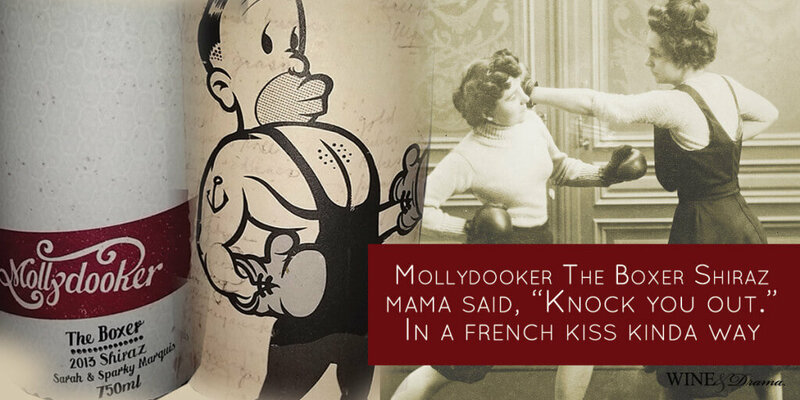 It knocks you out like a left hook, which incidentally “Mollydooker,” is Australian slang for a left-handed person. The Boxer Shiraz 2013 stands on its own. It pairs nicely with lamb chops, onion jam, gorgonzola, and a good baguette. Mollydooker The Boxer Shiraz wine is solid and tastes like four berry jam, ripe plums, mocha, cinnamon, and sweet smelling tobacco all rolled into one. I love the playful label and snark of the Mollydooker line of wines. At $24 a bottle it’s an elegant wine made whimsical that taste silky and reassuring on your tongue. I was a little bummed when my Russian wine husband (not really my husband, but he owns my favorite wine shop, let’s me taste anything I want, and let’s me tell him what to do – better than a real one) told me that the price was going up by $5 a bottle. Sigh, nice things cost money. I know, I know. But this wine is sustainably grown, so kudos to that. Now, back to my baby shower rant in progress. Sure, you’re enjoying your fourth glass of Champagne, but the poor mother can’t even drink. Now you’re just being rude. The best you can do if you really care about her, is drink heavily and after each sip, breathe on her so she can get a contact high – to deal with this level of ridiculousness that you’ve placed squarely in her lap. Which I’m sure she’s loving cause with her protruding belly, girlfriend doesn’t even a have lap. You’re so thoughtful. Now we come to the ladies attending. Invariably, someone is going to arrive there pissed off. Or odds are you’ve got two friends attending that fought over a boyfriend back in the day. Now that boyfriend is someone’s husband and even though…no one wants Clifford. Jocelyn still thinks Amanda wants to steal him from her. No she doesn’t Jocelyn. Then you’ve got an aunt who’s upset that she couldn’t bring her best friend that’s attached to her at the hip, and has to sit at a table with every other female family member and in-law she can’t stand. But thank goodness for your life of the party aunt, Sheila. Aunt Sheila is magnificent. She’s a snotty Nigella and sarcastic Ina Garten all rolled into one popped collar silver streaked hair maven. She even arrived pre-buzzed. She had her driver (her son) drop her off. Aunt Sheila is so much fun that you pray she’s going to stay for this entire fiasco. But then she informs you, she’s put a two-hour cap on her appearance at this event, so better enjoy it – while she grace’s you with her presence. Now we come to the part of every baby shower that I’m sure you’ve been waiting for …the games. I don’t do games – unless they’re mental, yet somehow I was forced to create one for this shindig. So, I made my BFF Kelsey create one…which was totally appropriate because Kelsey has resting bitchface down to a science and pisses everyone off. Then after ridiculous games that involve guessing stupid things and figuring out why good chocolate is being smashed into diapers – if you’re still sober you get to participate in the ooohhhingg and ahhhing of the presents being opened. Do you really care? I DO NOT. All I know is now I have to clean up shredded gift wrap, tissue paper, and ribbons thanks to my overzealous niece and her little friends who decided, they were going to “help” the mom to be open presents. Godddammmit, why so much wrapping and plastic on everything? Now, where are the men? Why aren’t they responding to any of our text messages? How the hell am I supposed to shove all this crap in my car and get it back to the mom’s house? By now most of the ladies are pretty much wasted and it’s the middle of the afternoon. There’s remnants of ham, quiches, cupcakes, and fruit that no one really eats…strewn all over and this whole place has to be cleaned and dissembled so the party rental people can come and take back their tables and chairs. My niece and her cousins have now progressed from petty vandalism to outright theft. They are stealing all the decorations. Godspeed little girls, take them and run. But stop stealing the guest party favors – those salted caramel chocolates from Etsy cost a small fortune…put them down now! Don’t make me search your Hello Kitty bag, little girl. Oh yeah, cause I love the mom-to-be like a sister and I’d gladly put up with this foolishness, so she can get all the loot she deserves for creating a brand new human. In fact, I look forward to the day 25 years from now when I can become Aunt Sheila. I can’t wait to make a fabulous entrance and then swan out leaving my new niece wishing I’d stay longer too. That’s why baby showers are my nemesis…I mean you can’t construct a more perfectly created villain to destroy a Saturday afternoon than that. But take comfort like Mollybooker’s The Boxer Shiraz, I’ll knock it out and then put my feet up and drink my wine until I forget all about it.